Hymenocallis is a genus of plants in the family Amaryllidaceae, subfamily Amaryllidoideae. It contains 63 species native to tropical and subtropical America. Hymenocallis are bulbous perennial herbs. The flowers have their stamens united to a characteristic corona. Hymenocallis means”beautiful membrane” in Greek, which refers to the staminal corona that connects the stalks of the stamens for a portion of their length. The plants have large spectacular flowers. 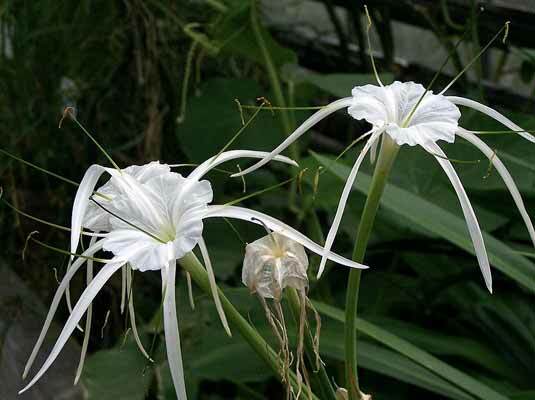 Some of the species are known as varieties of “spider lilies”. Hoop petticoat white flowers with the most beautiful perfume.